The 1964 Olympics have been everything that a track fan could hope for. Today, the final day of track and field competition, will be the cherry that tops the sundae. 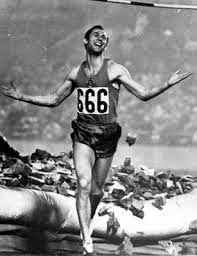 We will see if Abebe Bikila can defend the marathon championship he won four years ago in Rome against a strong field led by Aussie Ron Clarke and the owner of the world's fastest marathon, Basil Heatley of Great Britain. Bikila's form is in question as he underwent an appendectomy last month. Peter Snell put on a dominating performance in winning the 800. 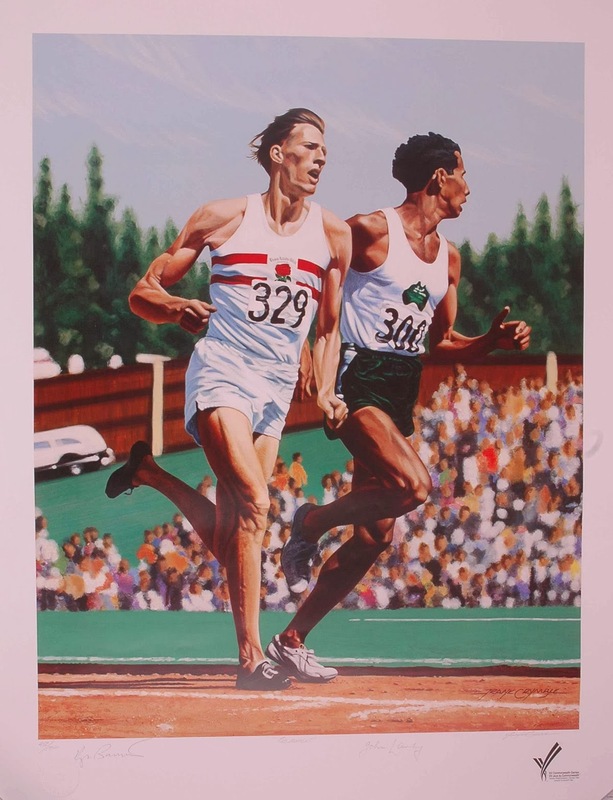 Can he win the 1500 today and by so doing, achieve the greatest middle distance double in Olympic history? 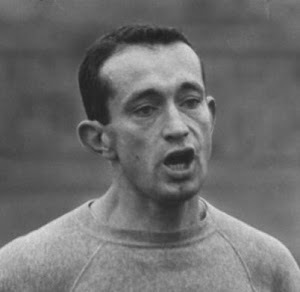 Valeriy Brumel of the Soviet Union is the world record holder in the high jump. He is the favorite today, but only three weeks ago he was defeated by his teammate, defending Olympic Champion Robert Shavlakadze. And then we have the relays, the 4x100 and the 4x400. 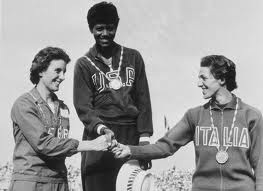 The US is the favorite in both, but remember we were the favorite in the 4x100 in Rome and didn't make the victory stand. In the prelims and semifinals our passing was spotty at best. The chance for an upset definitely exists. In contrast, the 4x400 should be money in the bank. 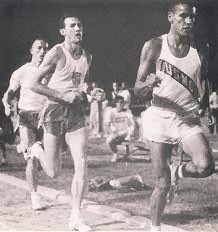 Yes, Jamaica, Trinidad and Tobago and Great Britiain have world record potential, but a win for any country other than the US would be a shock of Billy Mills proportion. 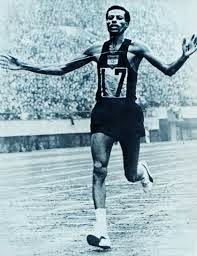 Bikila won in Rome running barefoot. Today he is wearing shoes, but the results are the same. He continues to pull away until he enters the stadium with no pursuer in sight. 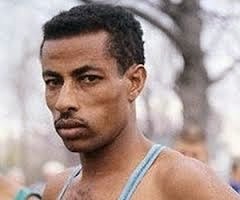 Not only has the sergeant in the Ethiopian palace guard defended his championship, he has won by a whopping 4:08 in the fastest marathon ever run, 2:12:11. Before any other runner enters the stadium he is stretching and doing bicycling exercises in the infield. “I could have run another ten kilometers,” he says. When the next runners come into view, the Japanese crowd comes alive for it is one of their own, Kokichi Tsuburaya, in second. 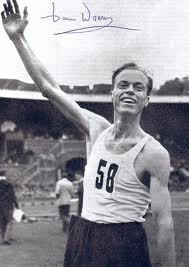 To the disappointment of the hometown crowd, he is passed by England's Basil Heatley on the last curve. Heatley takes silver in 2:l6:19 and Tsuburaya the bronze in 2:16:22. Still national pride flows freely for this is Japan's only medal of the track and field competition. 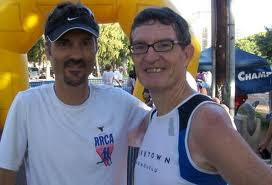 US fans are proud of the effort of Buddy Edelen who, although suffering from sciatica, finishes a strong sixth in 2:18:12, the best finish by an American since 1928. 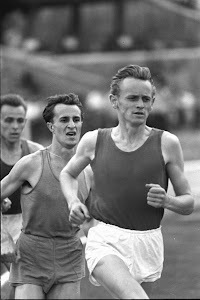 Billy Mills is 14th in 2:22:55 and Pete McArdle 24th in 2:26:24. Bikila says he prefers running shoes and will wear them in Mexico City when he will attempt to win his third Olympic marathon gold. An awkward moment takes place after the awarding of the medals. In a gaff uncharacteristic of the Japanese, the band doesn't know the Ethiopian national anthem. This “oops moment”, a sort of “I THOUGHT YOU BROUGHT THE SHEET MUSIC. NO, YOU WERE SUPPOSED TO BRING IT” thing is covered by playing an anthem they know well, their own. It doesn't seem to bother anyone. (note: for those of you who wondered what sort of shoes Bikila wore, they were described as “white”) (Check the film, they were Puma's). Lane assignment (and semifinal times) from the inside out are as follows: Great Britain (40.1), France (39.6), Italy(39.7), Jamaica (39.6), Venezuela (39.6), Poland (39.6), USA (39.5) and the Soviet Union (39.7). The US has been handicapped by poor passing, especially the first one between Paul Drayton and Gerry Ashworth. Today is no different and the Americans lose two yards. Could have been worse according to Ashworth,”Paul seemed to pull a little coming up to me and I got a slow start. It was a good thing I did because it worked out about right”. Obviously “just right” is not the description used by the US coaches. Ashworth gains back a foot down the backstretch and makes a good pass to Richard Stebbins who gains slightly on the leaders, Poland and Russia. France and Jamaica also are ahead of the US. This is the moment track fans have waited for, Robert Hayes down five feet on the anchor leg. Obviously it was the moment Robert Hayes had been waiting for also. His instructions to his teammates had been, “Just give it to me close”. Here is some not so great black and white of the 4x100 and a little bit of the marathon. 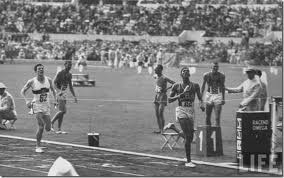 This piece is from the 100m sequence in the Tokyo film just to remind you of the power that Bob Hayes developed in his race. 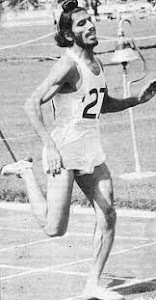 With what Cordner Nelson describes as “one of the most explosive pick ups ever seen”, Bob Hayes goes to the afterburners. 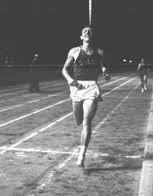 Within 30 yards he has the lead and doesn't let up until he hits the tape three yards to the good in a world and Olympic record of 39.0. 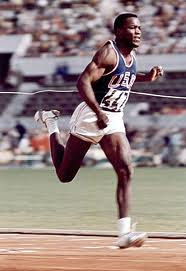 His victory in the individual 100 meters was impressive, outstanding, spectacular. This was better. No one in history, not chased by a predator, has ever run so fast. 1) USA 39.0 2) Poland 39.3 3) France 39.3 4) Jamaica 39.4 5) USSR 39.4 6) Venezuela 39.5 7) Italy 39.5 8) Great Britain 39.6. The first five teams broke the Olympic record, the next two tied it. 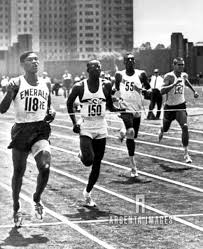 Unquestionably this was the greatest 4x100 relay ever. This stands to be a close race among evenly matched runners with the prize being the Olympic silver medal. 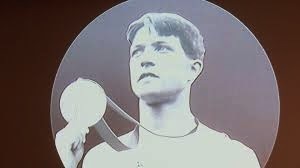 Unless he is struck by lightning, and it isn't raining, the gold medal belongs to two time 800 meter champion, Peter Snell of New Zealand. 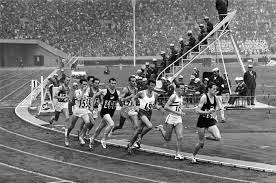 The competition includes the best the world has to offer: Alan Simpson and John Whetton of Great Britain, Witold Baran of Poland, Dyrol Burleson of the US, Josef Odlozil of Czechoslovakia, Michel Bernard and Jean Wadoux of France and Snell's New Zealand teammate, John Davies. Maybe, just maybe, if someone takes the chance of his career and sets an insane pace, well maybe there is a chance. These are intelligent men, experienced competitors, above all realists. 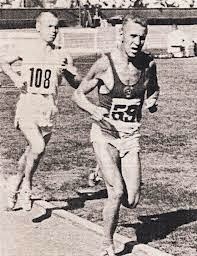 Better to go home with a secondary medal than be remembered for setting a foolish pace and finishing last. And so it goes. The first lap starts with some hope as Bernard leads through a 58.0 go around. Then caution creeps in. A 31.3 200 slows the pace to a veritable crawl. Davies takes over and picks the pace up with a 30.2 200, passing the 800 in a pedestrian 2:00.5. Snell, sitting in fourth, must be smiling. Davis cranks the pace a bit and continues to lead at the 1200 mark in 2:59.3. He is followed by Baran, Snell, Burleson, Odlozil and Bernard side by side, Whetton and Wadoux. This is where the youtube clip takes up the race. Once Snell said he wanted to run a 3:50 mile before he hangs 'em up. 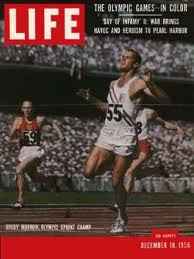 After this race he says he is going to retire to golf and tennis. We'll see. 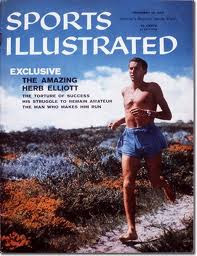 Whatever the future holds, today Peter Snell cemented his place as one of the great runners of all time. 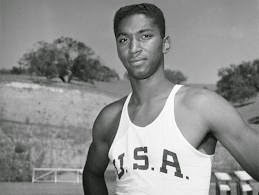 The American team that qualified yesterday ran in the order of Henry Carr, Ollan Cassell, Mike Larabee and Ulis Williams. Not believing the “If it ain't broke, don't fix it” adage, the team meets with coach Bob Giegengak to suggest a change. They want to move Carr to anchor, a request the coach doesn't favor, but he approves it. 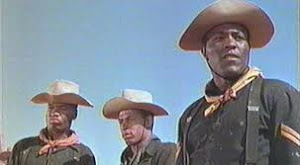 The order will be Cassell, Larrabee, Williams and Carr. 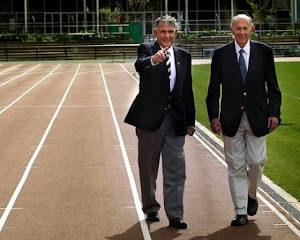 For the first time the Olympic 4x4 will be run with three turn staggers. The first runners will be in lanes all the way. The second runners may break for the pole on the backstretch. From the inside out it is Germany, US, Jamaica, Trinidad-Tobago, USSR, France, Poland and Great Britain. The first leg immediately splits the race into two sections. Tim Graham's 45.9 gives Great Britain a lead over the US (Cassell) and T-T (Edwin Skinner) who run 46.0. Jamaica (Lawrence Kahn) is right there at 46.1. Here the break occurs as Russia leads the next group at 46.8. You know you are in pretty good shape when your second leg is being handled by the Olympic champion at 400 meters, Mike Larrabee. The former SC Trojan clips off a 44.8 split to open a margin on T-T (Kent Bernard 45.3), Great Britain (Adrian Metcalfe 45.5) and Jamaica (Mal Spence 45.4). Ulis Williams' 45.4 doesn't open any ground, but it doesn't have to. Edwin Roberts matches that split for T-T. Mal's twin brother, Mel, gains a bit for Jamaica with a 45.2. Great Britain's John Cooper, the silver medalist in the intermediates, stays close with his 45.4. As the anchormen take the baton, the US leads by half a second over Trinidad-Tobago and Jamaica with Great Britain a tenth back in fourth. The US has already used the 400 champion on the second leg, so how about the 200 champ on the anchor? The last lap becomes The Henry Carr Show as the Arizona State star clips off a 44.5 split to bring the US team home in a world and Olympic record 3:00.7. Robbie Brightwell does almost as well, 44.8, to pass the 45.0 of Wendell Motley of T-T and the 45.6 of Jamaica's George Kerr to bring the Brits in second. The finish is 1) US 2) Great Britain 3:01.6 3) Trinidad-Tobago 3:01.7 4) Jamaica 3:02.3 5) Germany 3:04.3 6) Poland 3:05.3 7) Russia 3:05.9 8) France 3:07.1. 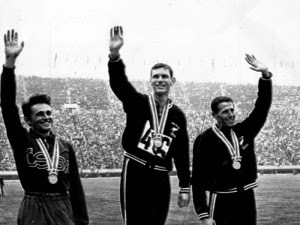 The first three teams bettered the world and Olympic records and the fourth missed by only a tenth. Scenes from the 4x400 can be seen at the 3:00 mark on this clip. World record holder Valeriy Brumel is the heavy favorite, but in yesterday's qualifying he missed twice at 6-9 1/8 causing concern in the Russian camp. Not to worry today. When he clears 6-11½, he trails only teammate and defending champion, Robert Shavlakadze on attempts as he started at 6-6¾ while Shavlakadze waited until 6-8 to begin. American Ed Caruthers misses three times at this height and is out. His teammates, John Rambo and John Thomas, and Sweden's Stig Pettersson all clear on their second attempt. These five move on to 7-0¼. This is where things get interesting. Pettersson and Shavlakadze miss on their first attempt. Rambo clears on his first attempt, an accomplishment which becomes more important when Brumel takes the bar off with his hand on the way up. Thomas also misses. Rambo, the Long Beach State basketball player, has taken the lead on misses. On the second attempt Pettersson clears, but surprisingly no one else does. It is down to the last attempt at this height for Brumel, Thomas and Shavlakadze. Adding to the drama, it is 6 PM, daylight is failing and the lights have come on. This is the last event of the day and the crowd has been filing out. Oops, wait a minute, Martha, this looks interesting. Let's watch the rest. Those who stay are rewarded with come through clearances by the two Russians and the American. The magic ends here for Petterson and Shavlakadze who go out at 7-1. Rambo needs three attempts to clear and falls to third. Thomas clears on his second try. Brumel is up and over on his first attempt and now sits in first. At 7-1 7/8 Rambo is out but his parting gift is pretty nice, a bronze medal. Thomas and Brumel clear on their first attempts, but Brumel still leads on misses. With the bar at 7-2 5/8, Brumel doesn't come close, but more importantly neither does Thomas and when he misses his third attempt, the gold belongs to Brumel. 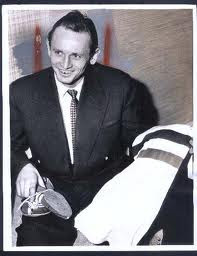 Maybe this wasn't pretty, but every time Valeriy opens his sock drawer and sees that Olympic gold medal he won't care. 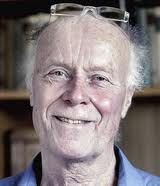 Note: John Thomas died January 15, 2013 at the age of 71. 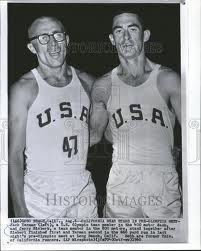 Brumel died Jan. 26, 2003. And so ends the best Olympic Games ever or at least the best until the next one. 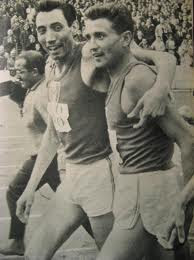 As we file out, we are warmed by the memory of Billy Mills amazing run, the dominance of Peter Snell and Abebe Bikila, the explosiveness of Bob Hayes, world records in the relays and Olympic records in abundance. In 1968 we will gather in Mexico City. How many of the great athletes whom we have seen in the last eight days will be there? For those who don't return, who will take their places? 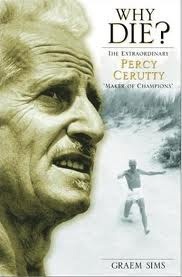 Is there a 1968 champion who as yet is unknown? Only time will tell. If you haven't read enough, here is the complete Tokyo Film all 2 hours and 5 minutes. v. 4 n. 89 Walk Ons - Who Were the Greatest? I haven't done any research on this, so I can't even give an opinion at this time. However I hope that your replies will form the basis of an interesting story to put on later. 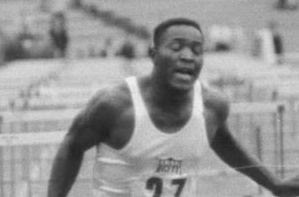 So if you can think of any track and field performers who came to a university on their own, without a sports scholarship, or maybe one that was a bust in a different sport and then turned to track and field and performed admirably that might be a slightly different but no less notable category. We're waiting for your stories. You can reply to me at irathermediate@gmail.com or post a comment at the bottom of this page. Mention the words 'walk on' in your reply, so I'll be able to separate the wheat from the chaff on my email. Since there are not scholarships in Div. III or the old 'college' division in earlier days, I suppose everyone was a walk on in that category. 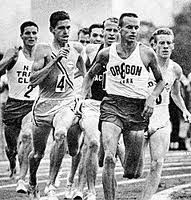 Thinking of that, I will throw in two Ohio Wesleyan runners, Quentin Brelsford who won or was runner up in the NCAA cross country meet just after WWII and John Guteknecht who made the US team in the early sixties in the 10,000 meters. So there's the gun to set off this discourse. 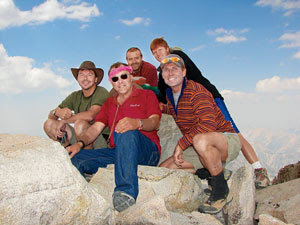 The text below from Darryl Taylor came to us through the grapevine, and it is clearly worth sharing with our readers. It is a brief comment from Darryl about Max Truex and at the bottom are two links to articles about Max's high school and college careers. War! I guess they didn't get the message. 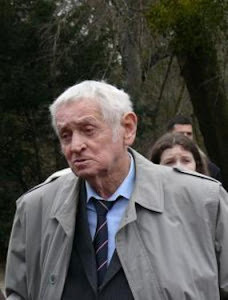 (that he had survived). 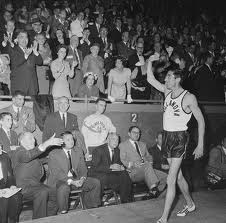 Zamperini's National Record in the mile. 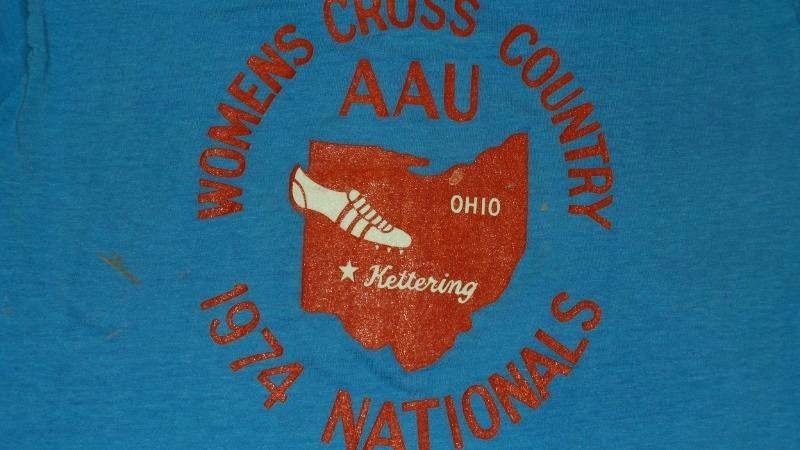 A few days ago, Phil Scott our inveterate collector of old track shoes and restorer of old bicycles sent me an E-Bay sale picture of a 1974 T Shirt for US AAU women's cross country championships. Our club , the Kettering Striders , had hosted that meet in Bellbrook, Ohio. The bidding was to start at $130 or you could buy it for $179, astonishing. 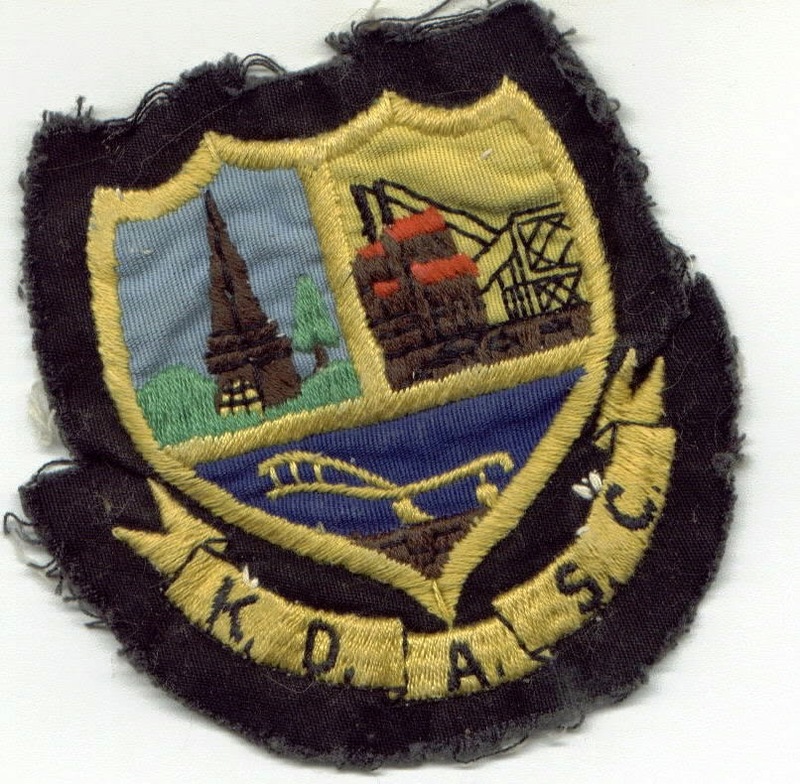 This looked like a well worn shirt from somebody's attic. Was it the cleaning out of an estate or the result of a divorce, I have no idea, but it brought out memories of my old T-shirts and the constant struggle with my wife to keep those old rags in the house and not put them out on the next trash collection day. I was hoping too that Steve Price who coached the Striders might still have a box of those shirts stashed in his basement. I would have offered him $5.00 each. Undoubtedly a few of you still have some of your old T-shirts or have memories of some of the really good ones. Maybe you would like to share some T-shirt stories? One of the great shirts I remember was from a 15Km race in Plymouth, Indiana called the Blueberry Stomp. Marshall County Blueberry Festival is tied in to that race on Labor Day weekend. It's a flat and fast course as I recall, though it's been 35 years since I've run there. The starting line was covered with several quarts of blueberries and that is where the race took its name. 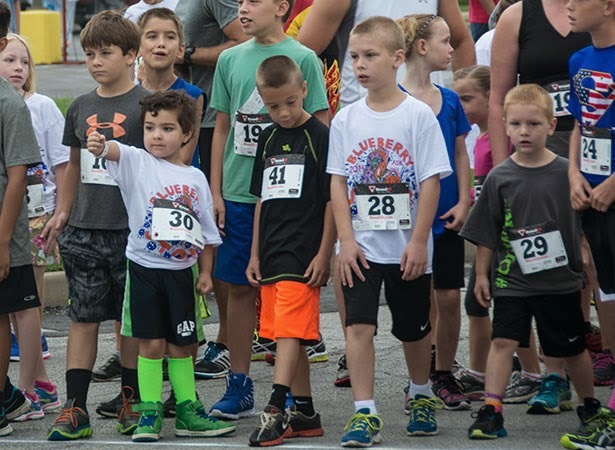 By the looks of the kids on last year's starting line, they still make a nice T shirt. We had one kid at Florida with some old cotton t's that you could see through. He loved those old shirts. I have two t shirts from 1968 Tiger Shoes Mexico City Olympic Rings (has holes in Armpits) and Alamosa, CO Olympic marathon training site. (no holes but thin). I usually wear them once every 4 years at Eugene, USOT. I had a 1957 MId Atlantic Road Runners T, but I think Judy pitched it. 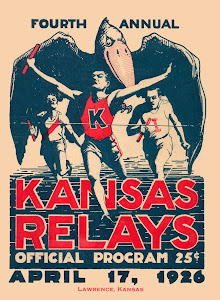 Sadly, I do not have a collection of old running t-shirts. 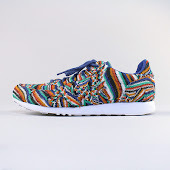 I gave them away freely over the years to friends, other runners, family, etc. A couple even got tossed out as "being around the house forever," according to my wife. At one time I was famous in our little Lehigh Valley (PA) as the guy with all of the foreign t-shirts from my ramblings across Europe, Asia, Africa, and the Middle East - but folks would admire them & I would give them away. All good things come to an end. P.S. I like your new format! T shirt from 1960. I plan on taking all the "junk", ahhhh, outfits down to the USOC office next week. 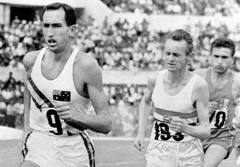 me so well and a credit to Ernie for setting such a tough pace.' "
Well, done Ernie, in turning over those items to a place where they may be cataloged, preserved and displayed in the future. Nice web site upgrade. Youi're a whizz! 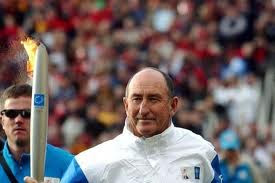 Does Jerry McFadden help with the technical side, too? I have two Olympic Jersey's from the 1968 Games. 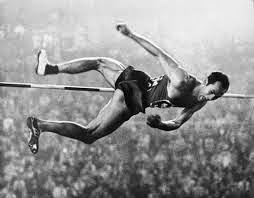 The first is from Australian High Jumper Tony Snezwell. The seonod is a West German Olympic Jersey from Arndt Krueger of UCVLA/Germany.. 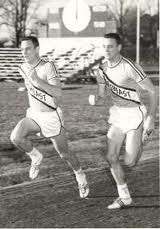 Believe it or not, they were willing to trade their second Olympic Jersey for a Southern California Striders T-Shirt. we were just that powerful and famous back then! I kept for years along with many other treasures I had swapped over the years. twice a gold medal discus winner in the Commonwealth Games plus a bronze in the shot. 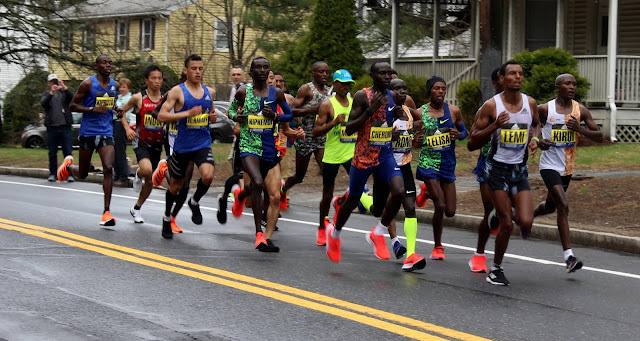 Going on about Phil Scott who has been featured on this blog with his collection of track shoes and his son Jason who coaches with Phil at Cedarville University in Ohio, Phil is one of the nation's major track nuts. You could call Phil in the middle of Thanksgiving dinner next week and he would talk track with you until late in the night. His mother once told him, "Phil, I only asked you what time it was, not how to make the watch." 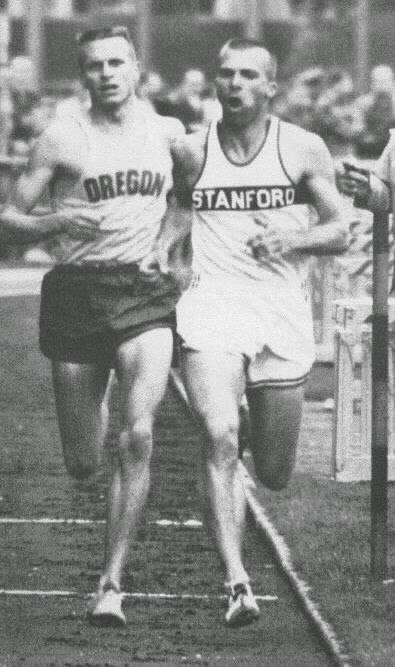 Well, back in the early 1970's Phil was a fair to middlin' decathlete winning the US juniors in 1970 and US JUCO championships in 1974 at Santa Barbara. Most of us who have seen the picture have sent some comments around. We're not sure Phil was this big, but maybe he was, and our memories have just faded. Here is some of the chatter the photo elicited beginning with Phil's first message. I cannot remember him being that big, but who knows. Maybe he will send us a 'just kidding' email. On the other hand I don't think he has the means to put his head on someone else's body. Steve. Hey Folks that is me all 185 lbs 5'10" body only supplement I took or could afford was flintstone vitamins. I lifted 3 times a week in old building behind my home . 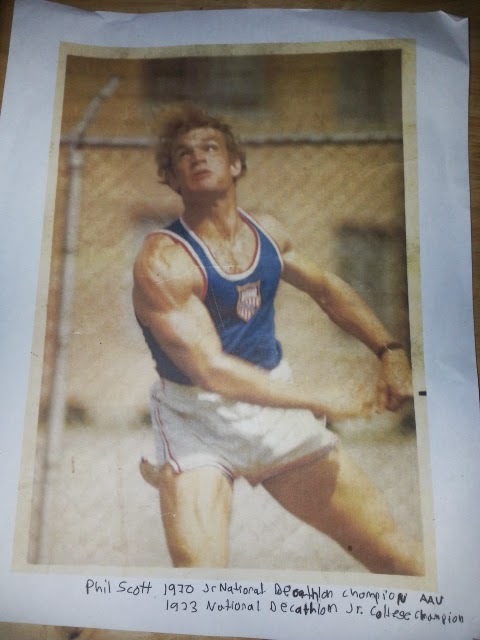 I think Greg Price though was bigger and stronger than myself. Coach Barney Cook from strides put me on a weight schedule. I could bench 340. Squat 450 dead lift ??? Took a beating on me later after 12 hour back surgery. I was clean but could not beat cheaters. But I have a conscious:) Thanks for all the nice comments and for Steve Price being my coach and motivator! 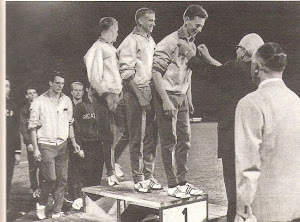 I won Jr . NATIONALS 1971 PENTATHLON INDOOR NATIONALS PENTATHLON 1972. CA. 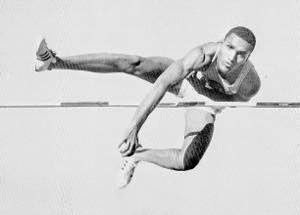 JR. COLLEGE 1973 DECATHLON. 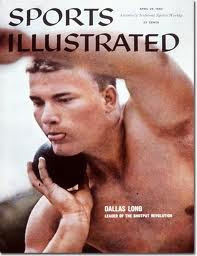 1972 OLYMPIC TRIALS Qualifier. Could not compete a nail went through my foot on construction site. 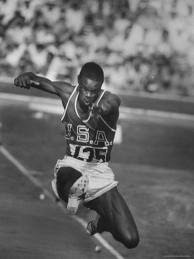 It's not often that someone wins 10 Olympic gold medals in Track and Field and goes unrecognized later in life. 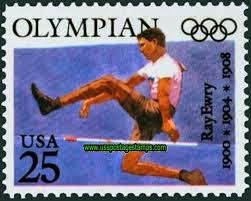 That is the case with Ray Ewry, multi time champion in the standing long jump, high jump, and triple jump. 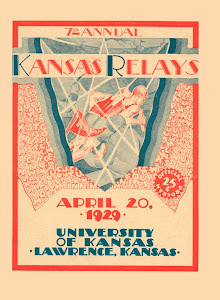 Only the advent of the running LJ, TJ, and HJ put those events out of business over 100 years ago, but back then it was a hotly contested item (for second place) if Ewry was in the competition. 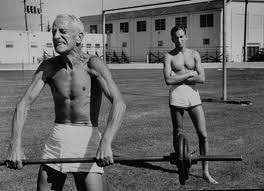 Suffering from polio at an early age Ray was encouraged to excercise and eventually developed strong legs that would carry him higher and farther than his peers. 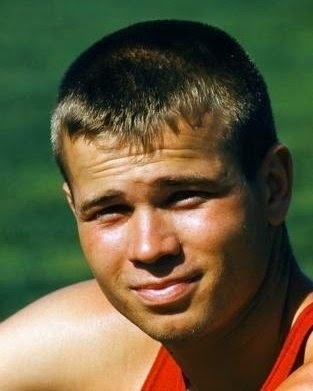 His home town of Lafayette, Indiana is getting around to honoring him in a number of ways including naming a road after him two years ago (see article below from wlfi.com) and several other things. 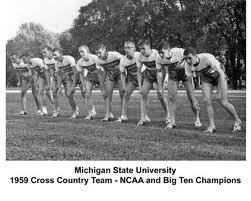 He competed for Purdue and led them to a national track and field championship, earned undergraduate and graduate degrees in engineering and worked for many years as chief water engineer for the city of New York. 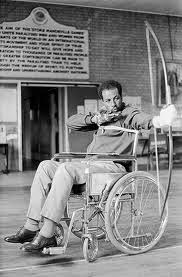 Links to several articles about Ray Ewry are listed below. LAFAYETTE, Ind. 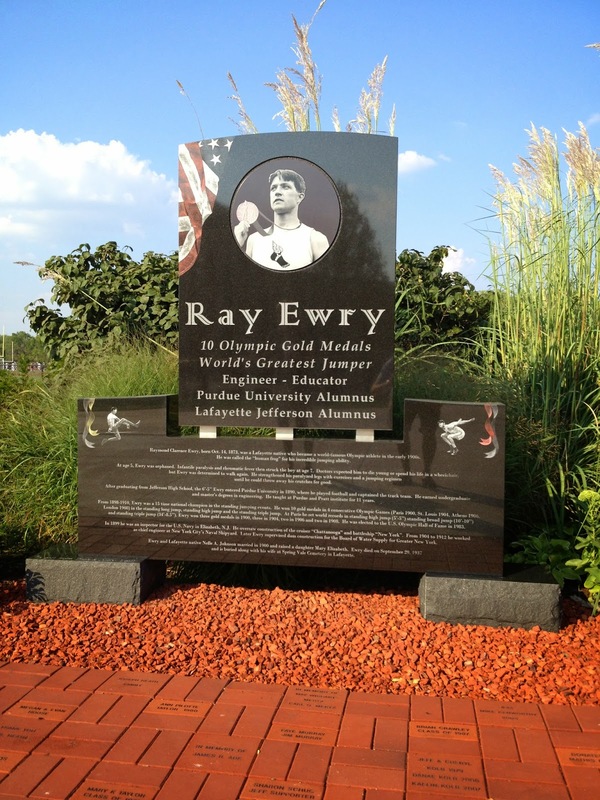 (WLFI) — A section of the new U.S. 231 is being named after Lafayette sports hero, Ray Ewry. A ceremony was held Friday at Jefferson High School in Lafayette to celebrate the renaming of a stretch of the highway in West Lafayette. 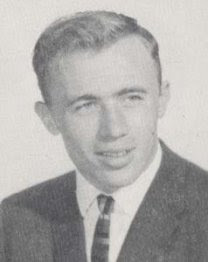 The section of U.S. 231 between Martin Jischke Drive and Lindberg Road will bear the name of Ray Ewry Memorial Highway. Ewry’s grandson Tom Carson made the trip from Baltimore to speak on his behalf. 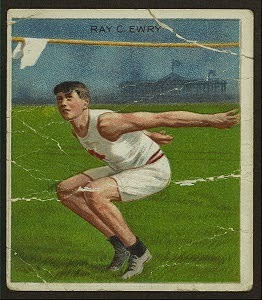 Ewry was a graduate of Jefferson High School and Purdue University. 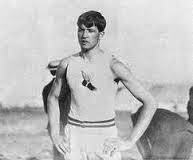 He led Purdue to a national championship in track and field and won 10 gold medals in the Olympics from 1900 to 1908. Some of our casual and first time readers are experiencing a new look on our blog. We hope this makes your reading and research into past blog postings much easier to search into and find old posts. By clicking on any of the boxes, that particular posting will open on a full page. If you are trying to find a particular article or information about a particular individual or event , go to the white box in the upper right hand corner and type in that person's name. Then click on the box and any article containing that information will pop up on the screen. If they appear multiple times, you will have to wade through each posting, but you won't have to wade through every post that we've made over the last four years. You may also alter the appearance of the blog on your own screen by going to the left side of the page where there is the term "Timeslide" shown next to "Home". Click on "Timslide" and several other format options will open for you to select. You can experiment and find one that you prefer, or just ignore this option. To get back to where you began, click on "Home". If you wish to comment on a posting , I think it will now be easier to do at the end of each article. Furthermore, creating this new format has somehow bumped up our exposure on the internet. I don't know why this has happened but maybe some techie reading this can help us out. Our average number of hits on the site per day was about 250, but in the last 18 hours it has been over 1000. The comments sent to us by several readers have been positive about the new format, so unless something unforeseeable occurs, we will continue on this track. 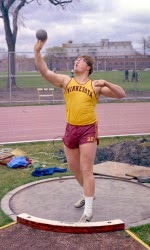 It is a sad time in the track and field community in Minnesota marking the passing of former US Olympic team shot putter, Colin Anderson on Monday November 10, 2014. 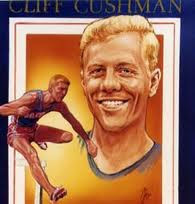 Colin, a graduate of the University of Minnesota, was ranked sixth in the world at the time he made the US team in 1980, but was unable to compete in Moscow due to the American Olympic boycott. 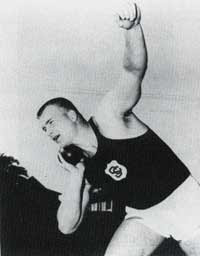 He leaves behind his wife Lynne (Winbigler) Anderson, also a member of the 1976 and 1980 teams as a discus thrower and his son Thomas an up and coming shot putter now at Arizona State. Both Colin (Elk River HS) and Lynne (U. of Minn.) have been long time coaches in Minnesota passing on their skills and knowledge to many young throwers and most notably to their son Thomas. 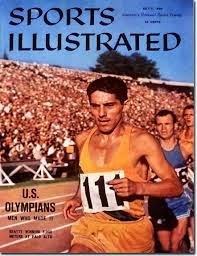 After a lot of frustration trying to do a post on Olympians who have died in war, and partially giving up in frustration until I can sit down and start over completely, I've decided to let you in on a good photo website and review a book about the 1908 Olympic marathon. Let's start with the book. Showdown at Shepherd's Bush, The 1908 Olympic Marathon and the Three Runners Who Launched a Sporting Craze by David Davis Thomas Dunne Books, St. Martin's Press, New York 2012, 308 pages. Not having heard or read a review of this book, it was one of those pleasant benefits of browsing one's local library that brought this work to my attention. 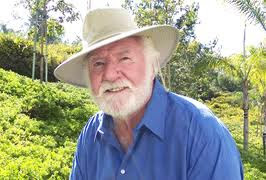 David Davis has done quite a good bit of research to prepare writing this book. There are almost fifty pages of acknowledgements, notes, and bibliography which themselves are most valuable reading, not to mention the main text. Shepherd's Bush was the site of the new Olympic Stadium constructed on very short notice in London after Italy withdrew from sponsoring the 1908 Olympics. The eruption of Mt. Vesuvius created enough of a disaster in Italy, that the Italians threw up their hands and abandoned their commitment to hosting the games. 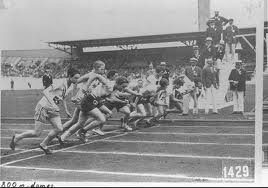 England took things in stride and put together a stadium with a 660 yard velodrome, surrounding a 581 yard (3 laps to the mile) track with a swimming pool in the infield that was ready for the start of the games. The early days of the Olympic movement were less than idyllic and possibly near abandonment after two disastrous games in St. Louis and Paris. 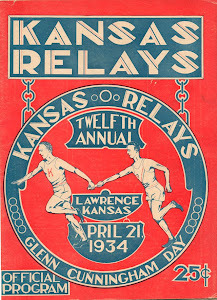 The St. Louis event was described rightfully as more of a side show for aboriginal and anthropological games, more resembling a circus side show than an international sports event. 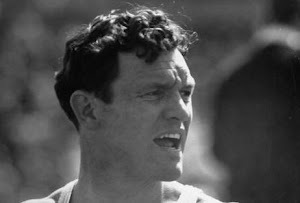 International athletics (track and field for Americans) was still in its infancy, and the games went under local British rules which caused several major 'misunderstandings' between overbearing American officialdom and British aristocratic loftiness. 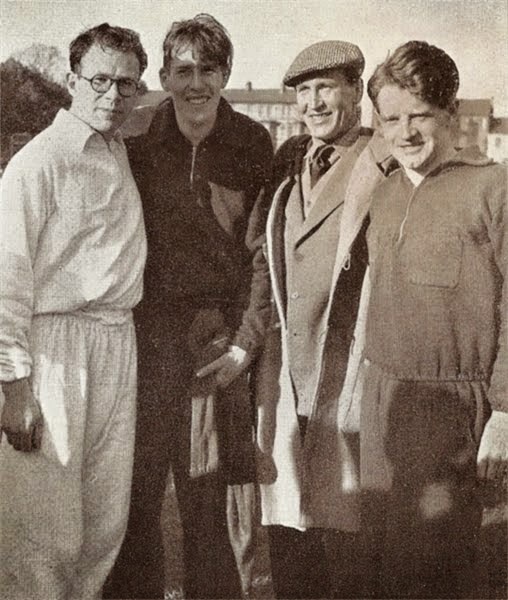 James Sullivan representing the American interests at the Athletics competitions was constantly at odds with the effete hosts. 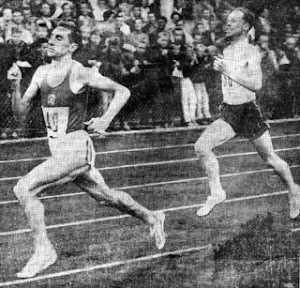 The 400 meters was the main event of contention when John Carpenter, the American winner, was disqualified for moving and interfering with his British counterpart to the point that they both ended up in the outside lane at the finish of the race which was run without benefit of lane lines. 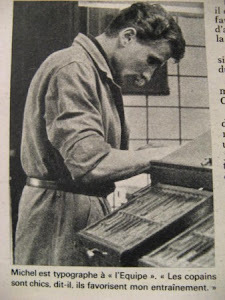 British officials disqualified Carpenter and ordered that the race be run over the next day. 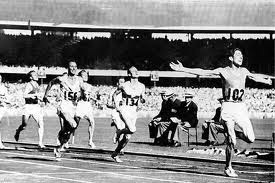 Under protest Sullivan refused to allow the other two Americans to run and the race was conceded to Wyndham Halswelle the British champion. 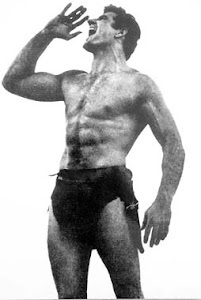 Halswelle would die in WWI. 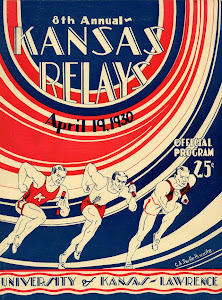 The meet had already been a great frustration to the English hosts as the Americans had claimed the majority of victories on the track and in the field. In fact the rest of the world was all but unacknowleged here as the results looked more like a triangular meet between the British, Americans and the Italians. 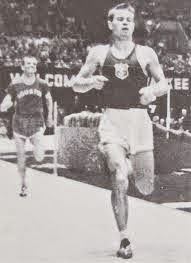 That led to the running of the Marathon the following day. Indeed this was where the 26 mile 385 yard distance in marathoning was determined by the course layed out by the organizers beginning in the garden at Windsor Castle where the Princess of Wales and her children could watch the start. 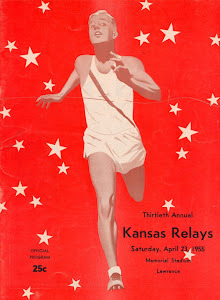 There had been a lot of pre-race excitement about the event as marathoning of distances in the 20-25 mile range had become of major interest to the public and especially the gamblers. 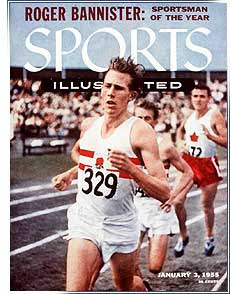 Three men were listed as favorites, Dorando Pietri of Italy, Johnny Hayes, of the US, and Tom Longboat of Canada. 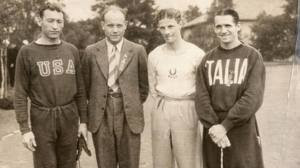 The race ended in the famous collapse of Dorando Pietri on the track and his being assisted by officials and eventually disqualified with Johnny Hayes declared the winner. Longboat, the overwhelming favorite dropped out. 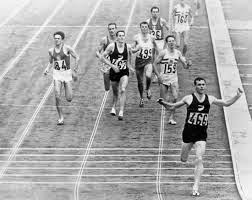 But this led to future races being set up between the three to determine time and again who indeed was the greatest long distance runner of the day. 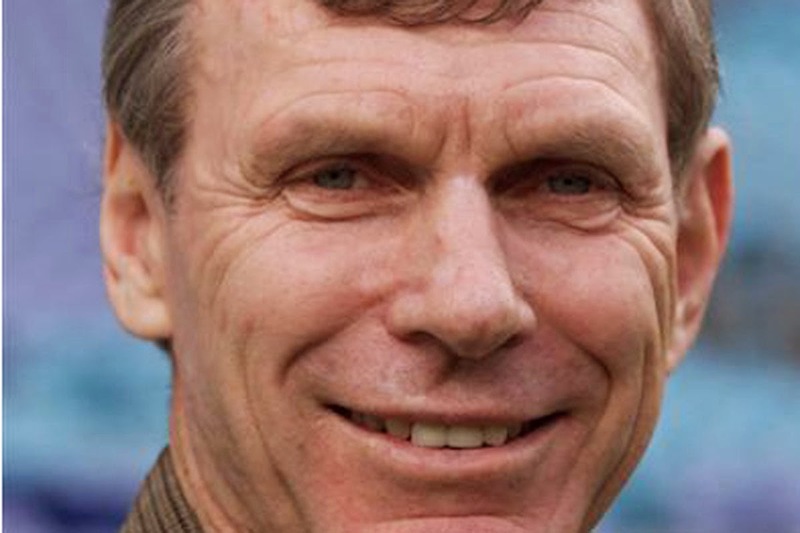 David Davis brings this story to life with a clear set of skills that draw the reader into the story of each of the three men from childhood, to mature runner, to eventual downfall of all three. 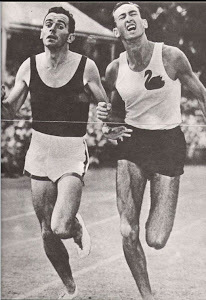 There is much discussion of 'managers' in those times who acted much like today's modern 'agents', gambling, amateurism, doping which allow the reader to do a lot of on site comparisons to modern marathon running. 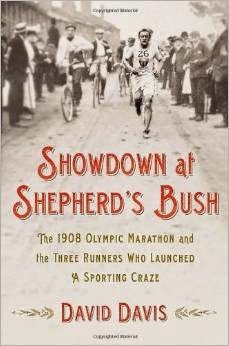 I can enthusiastically recommend this book to those with an interest in history both social and sportive. Now to the photo website. 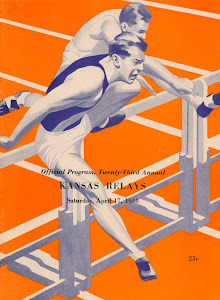 This site was found when I was looking for pictures of hurdle races in the early twentieth century. It will take a major expert to ID even the best known athletes. Go to and enjoy.